Owning our own house makes us very aware of how much it costs to heat and where we can improve on efficiency. As the winter approaches and the air gets colder, we've noticed a few places that the breeze manages to infiltrate the house. 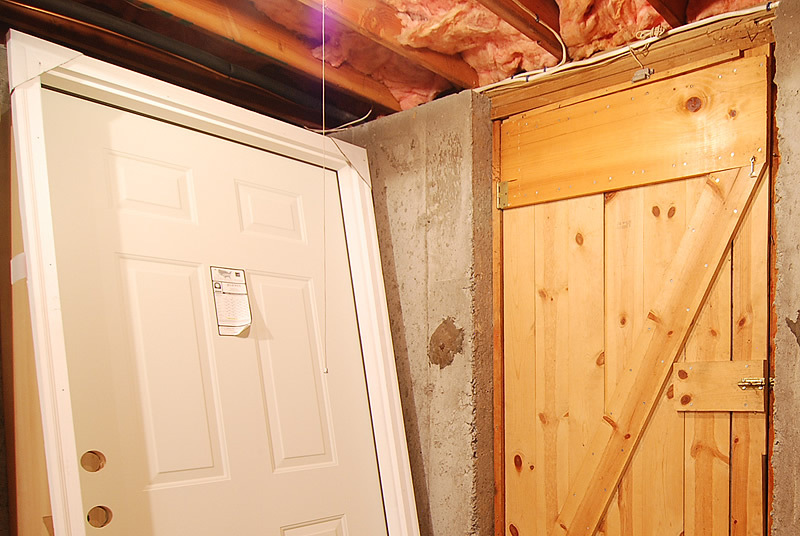 The old basement door was a particular problem. The previous owners had built a door from 3/4" boards that wasn't sealed and had large gaps. Even though we have an insulated ceiling in the basement it makes sense to try to keep the space as warm as possible, especially since that's where the majority of water pipes are. The new exterior door went in relatively easily and we'll find out tomorrow if it feels any warmer down there. The new dead bolt latch is also a lot more secure than the flimsy sliding latch that the previous door had. It was great watching your video of the door installation. You have really caught up with your blog now - by the way, did you check out mine?